Party on from day into night with the Igloo Party Bar, featuring our exclusive LiddUp LED light system that sets the party mood and illuminates the cooler’s contents when darkness falls - letting thirsty guests find what they want quickly. With aesthetics that channel outdoor beer chests of a traditional Texas ice-house, this cooler anticipates your every merry-making need, from a removable lid and drink dividers to mobile-ready locking casters on a detachable base. Style, function, and easy clean up - the Igloo Party Bar is the light of the party. Operates on four AA batteries (not included). Some assembly required. 16 water-resistant, heat-free LED lights provide 360-degree interior lighting allows the party to continue when the sun goes down. 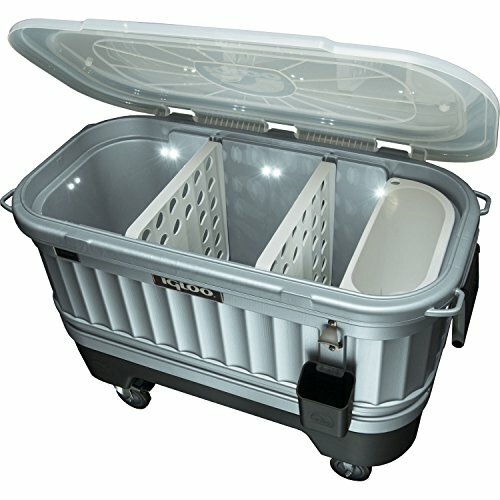 Heavy duty locking casters on a removable base makes it easy to move when full.